Google AdSense is one of the most lucrative income sources for many bloggers out there. People have made millions of dollars just using Google AdSense on their blogs and videos. Google has paid over a billion dollar last year to it's publishers. We all know AdSense is huge BUT what if we get banned or we're not lucky enough to get approved by Google AdSense program? There is always a hope in life! Everything is possible as there is no dead end for those who work hard and never give up. I recently posted this highly motivational Info graphic on BloggingeHow's Facebook page that you can check out. The crux of the story is, never give up and that is exactly why you're here to read this post! I'm proud of you! How many times you should try? A very motivating Info graphic! No matter how tough situations are, never give up! Because there will be a time when you would look back and say, "I'm glad I didn't gave up <3 "
This post is dedicated to share the best and highest paying Google AdSense alternatives that you can apply for and utilize on your blog. This list is in no particular order. Your earning from these platforms will highly depend upon the niche your blog is in. I would recommend you to try out each for a 15 days or a month for better data to analyze. Though there is no way I believe that these platforms are more lucrative then Google AdSense, though you'll still make a decent amount with these InshaAllah. AyBoll is fairly new in market and spreading like crazy fast. This is basically a CPA (cost per action) ad network, which pays you out on every sale that is made via your ads. Their ads are basically a widget that you place on your blog anywhere that you feel would gain the maximum attention of the readers. You can read out Top 8 Spots To Display/Show BuySellAds BSA Ad Banners? to know which are the highest attention grabing spots on any blog. Though as AyBoll provides a widget, the best place for you to insert is in sidebar, below post title, or just after the post ends i.e below post body. Once you make enough sales via that Ayboll ad widget that you make up 100$, you can then cashout via wire transfer or by using your skrill account (a popular payment processing platform). AyBoll has a very lucrative payment policy where they pay 50% of the sale via ad widget to the publishers. Though this can not beat if you would promote any clickbank affliate product on your blog, which sometimes even offer more than 70%, still its a good way to start as affilaite marketing is not that easy. In this case, you just have to install an ad widget and wait for the sale to be made. Adversal is a CPC (cost per click) ad platform just like Google AdSense which offers a variety of Ad banner sizes. They require the publishers to have at least 50,000 page views per month to get approved. Also they have a long list of requirement that you can read out before they approve a site. All the payments are made 35 days after the month ends (as per NET35) and you the minimum par to get paid is that you have earned at least 20$. They offer couple of cashout options like wire transfer, paypal, check, ACH. They also pay 20% commissions to the affiliate, so you can signup for that and earn for referring people to their platform too. You can read out their publisher FAQs and application prerequisites. If you're rejected, you can then again apply after 30 days after improving your blog. Buysellads is by far the best AdSense alternative I know of. It's super difficult to get approved as they have a tight criteria. This is basically a fixed price banner advertisement platform where you create ad zones on your blog and then your blog is displayed on their marketplace under a certain category. Advertisers from all around the world search for their target category and depending upon the rates that you have set on per month basis, they could buy your ad spot. Buysellads take 25% of the amount you earn on each ad spot that you sale. We can cashout via wire transfer if our account balance is more than 500$, while for Paypal, I guess we only have to have 25$ earned. They also offer payments via cheque. If you can get approved by BSA, there is nothing better than that. You can checkout BuySellAds Inspirational Growth Time Lapse! 2007-2015! to know how far this platform has come. Also read How to Make Money with BuySell Ads Advertisment Programe.and How To Price Your BuySellAds BSA Ads? to learn in depth about BSA. Chitika, founded in 2003, is there in market since quite some time and the platform has improved a lot. They have over 350,000 publishers to date. It's a CPC (cost per click) platform similar to Google AdSense which lets publishers customize the ads. They display targeted ads based on the content which helps in increase click through rates. Chitika is a must try. Infolinks is a text based ads platform where their system chooses the appropriate keywords on your blog and blog posts which are then turned into ads. 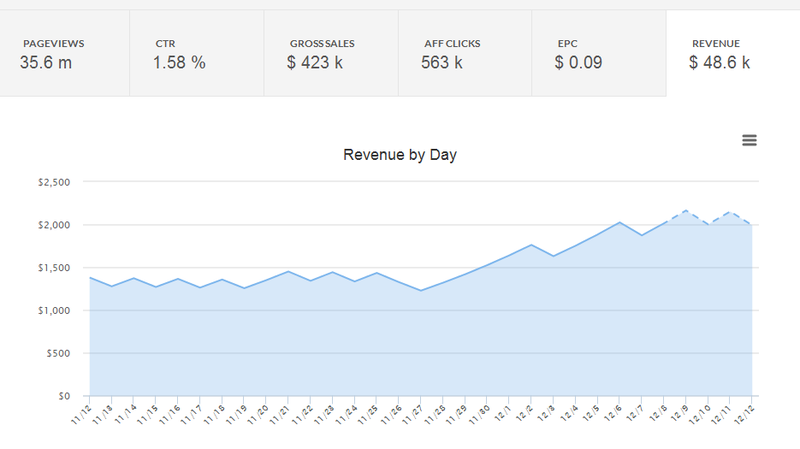 Each time a user clicks those ads, you get paid as a publisher. Even though I have tried Infolinks in the past and believe their cost per click is fairly low, still as these ads are text based, they get clicked a lot. I mean really a lot. Far more than Google AdSense ads. You can try them out and see if it works in your niche. They have different forms of ads now like static ads that take over your unused space in the margins of the blog, both on left side and right. Then you can ad fixed text ads just like Google AdSense's text ads. Also we can install in frame, in tag ads too. Do give it a try. ##check## Are You With Me? I hope you're enjoying the post and not bored out. Keep reading and you'll love the next two platforms which are Viglinks and Skimlinks! These platforms have a huge potential to help people make a living online. I haven't personally tried Viglink, but I'm already in love with it! Knowing that the coming was Incubated by Google and the visual aesthetics of it's landing page, I was sold. VigLink is much like a affiliate link cloaker which scans your blog's keywords and automatically ads affiliate sales links to them. Evey time you would make a sale via those links, you would make a sale! How cool is that? As many link cloakers are only available for WordPress platform and many people on Blogger are left out. You can check out a demo of the reports page from the platform. They have couple of products as shown below. Viglink Convert: Which changes your blog posts keywords into affiliate links. 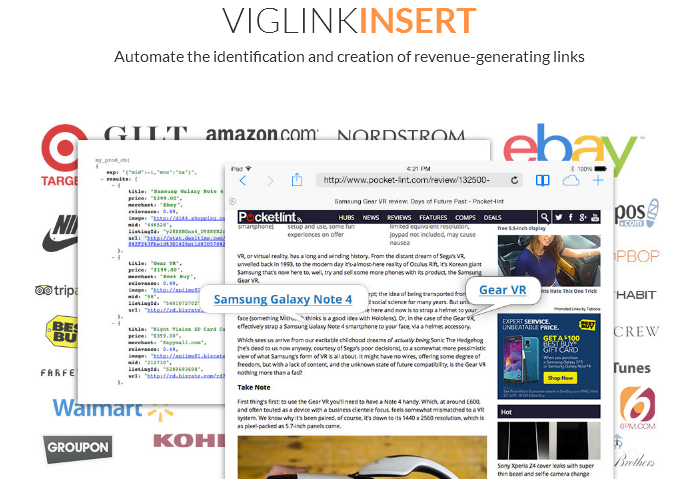 Viglink Insert: Which automate the identification and creation of revenue-generating links. 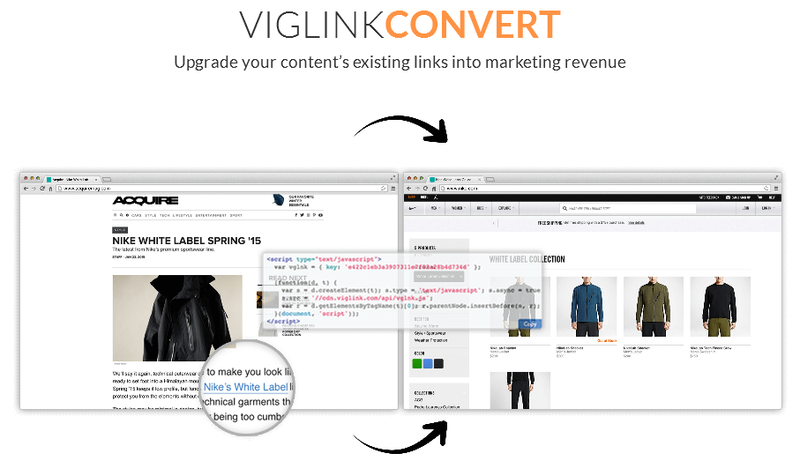 Simply add one line of code to your site, and VigLink automatically turns existing links on your pages into revenue generating links. VigLink can also insert new links on relevant terms and phrases to capture purchase intent. Viglinks also works great with forums where it turns the comments and it's keywords into affiliate links. Skimlinks is a competitor to Viglinks and it converts your blog post keywords into affiliate links just like Viglinks does. You can try out any of these 2 platforms. What's even great is that Skimlinks works with mobile apps too. So you could convert your mobile apps text into affiliate links too and earn on every sale that you would make. There are over 1 million content creators that work with Skimlinks and it's overwhelming to just land on their website. The edge we get to use Skimlink is that they have partnered with over 20,000 affiliate programs so that we don't have to signup for each which is a HUGE hassle and nearly impossible. Also, another awesome feature is that there is hardly any impact on search engine optimization. The links are converted dynamically on run time i.e that users only see the link you have entered manually, while when they click on it, they get to see the affiliate product landing page. If you're confused, you can checkout their awesome visuals of 'How it works'. Skimlinks Vs Viglinks? Which To Choose? If you're confused like me at this point, you can read this great resource on Quora where people have shared their honest reviews about both the platforms. I'll InshaAllah do a thorough research on both of these platforms and will soon be writing a detailed review on their comparison. 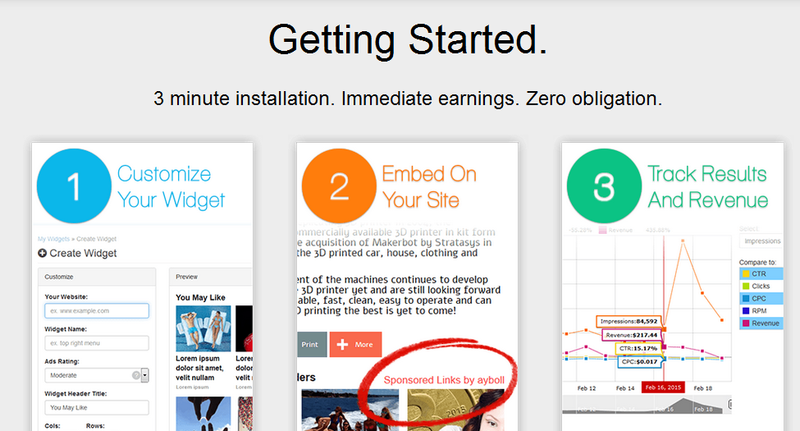 Media.net is a popular contextual ad platform just like Google AdSense, powered by Yahoo! and Bing. I personally tried this platform a while back and was amazed to see their cost per click was super high when I installed the ad codes. Though soon I saw the earnings were dropping and cost per click dropped too. I was strange. Though I have read a lot about people making decent amounts using Media.net too. If your blog has quality content, you'd see pretty high paying and relevant ads being displayed. You can read out difference between Google AdSense and Media.net. Adengage is a competitor to Buysellads as it offers fixed rate advertisements. Adengage is a very old player in the market and has sold over trillion ads. You can read these 12 reasons why publishers make more money with Adengage. You can also read these FAQs for publishers to get to know more about the platform. I'll keep on adding to this list InshaAllah, Make sure you bookmark this list! Also if you think this post was helpful, kindly give it a push by sharing it in social media :) Till next time, Allah hafiz. I collected the best resources online that teach us how to make money online! These are not your ordinary blog posts. These the articles that have been shared over million of times over social media! yes millions! 9 Super Valuable Resources You Need To Bookmark!